I want a gold pen sword. Imagine stealing a Maserati from the floor of a casino, jumping off the Empire State Building (which secretly holds the entrance to Olympus) or finding the entrance to the underworld under the H of the Hollywood sign. Not the norm for a typical human, but if you were a demi-god — it may just be your typical week. Just some of the hi-jinks in Percy Jackson and The Lightening Thief. I guess if you had to describe it in a comparison to other movies it would be like Harry Potter, but instead of Daniel Radcliff as the lead, you have Zac Efron. No the lead isn’t actually Zac Efron, but Logan Lerman as Percy Jackson. He is a pretty good look-alike or voice double (seriously, he sounds exactly like Zac Efron at some points). Percy Jackson is a demi-god — half human, but son of Poseidon (Kevin McKidd or that dude from Grey’s Anatomy). With this little piece of information, it opens up a world based on Greek mythology. Still based in reality with this supernatural twist — which I think is better because you can still associate with each character — you can pretty much assume, if we’re playing with demi-gods here, anything can go — all Gods are in essentially — Zeus, Hades, Poseidon, Athena, including their powers. At first getting told you’re the son of a Greek God you would naturally think it was unbelievable, but then of course you get awesome powers and a few nifty tools. A sword, chuck sneakers with tiny wings, a collapsible shield and then there is the casual lightening bolt. Which brings me to the special affects. They were awesome. Not over the top, not crappy. Enough said. 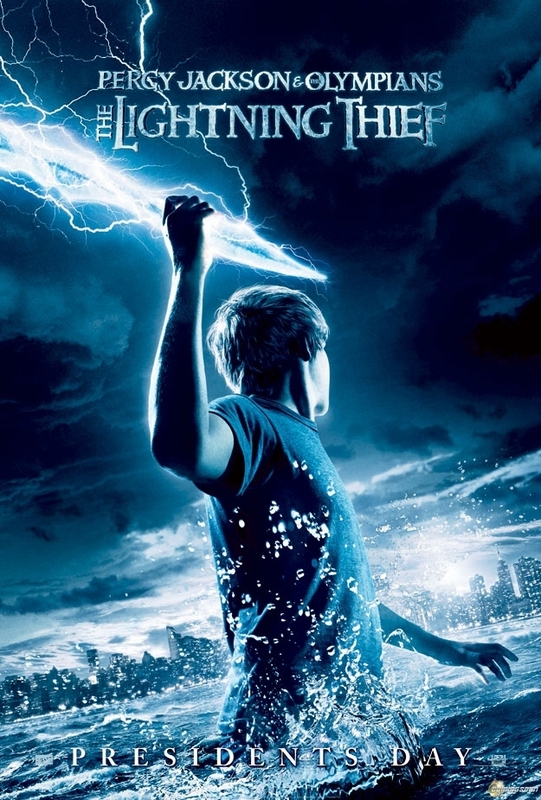 Once again — it’s a book in to a movie, based on the same name and written by Rick Riordan. Unfortunately I cannot speak for how successful the adaptation has been, as I have never read the books. However, there is no way that an original script from Hollywood would be able to provide a detailed story-line and in-depth characters of this type if it wasn’t first a book. I can say though, that I will be going to the library tomorrow to look for all the books in the series to see how they measure up to the Hollywood adaptation. One question I do have is, how old are the leads supposed to be? The feel of it is mid-to-late teens, bout 16/17. Lerman himself is 18. But as I understand it, in the first book Percy is 12. That right there is a big inconsistency. However, as certain scenes are portrayed it is more believable that a 16-year-old would be doing them, than a 12-year-old. Everybody seems to be comparing it to Harry Potter and yes I agree there are similarities. Chris Columbus directs, the heroes are a trio (two boys, one girl), the creatures are similar (only because JK Rowling got most of her ideas for creatures from Greek mythology), they attend a school for demi-gods (called Camp Half-Blood — seriously there could be a better name: Camp Olympus, Olympus College, School of Olympus? Just throwing a few out there.) and of course getting to go on a quest and fighting a bad guy. When Harry Potter came out, people compared it to Lord of the Rings. This type of thing is always going to happen. There are some memorable moments — when Mr Brenner/Chiron (Pierce Brosnan) hands Percy a pen and says to use it only in times of great distress he replies with “It’s a pen.” Yes, a pen, but a very cool gold pen that when you click it turns into an awesome gold sword. I bet you don’t have a gold pen sword. Also when Grover (Brandon T Jackson or the real black dude from Tropic Thunder) starts taking off his pants, Percy asks why, so his legs can be free – turns out he’s half goat (did not see that one coming), or a Saber, to keep this mythology correct. If they decide to adapt the rest of the books in the series, I will go see every single one at the movies. I feel this new series can be just as successful as Harry Potter and Twilight and definitely should not fall by the wayside like The Golden Compass, Chronicles of Narnia and Spiderwick Chronicles. It is something different and the mythology is interesting. How often do you get movies about Greek Gods? ← Another brick in the wall? Shut yo’ mouth.